I had always just taken musical notation for granted. When I saw the title of this book, it dawned on me that there had to be a beginning. Someone, sometime, had to decide to try to record the music. And so I read and found it amazing that we learned to make signs that can represent sounds. Legend has it that Gregory the Great (Pope 590-604) is the source of the service music of the Roman church, and that he received the chant from the Holy Spirit in the form of a dove singing in his ear. Therefore the chant must be kept pure, not a note, not a syllable changed. Since there was no musical notation at that time the chant was passed down from generation to generation by careful memorization. Early attempts to record the sounds were not very practical, but the use of neumes or signs began to catch on. They were just little marks to indicate higher or lower pitch, useful to remind a singer of what he already knew. Then about 1030 Guido the Monk developed a technology for writing and reproducing music. He gave names to the notes and put them on parallel lines. Thus began the slow process of recording music. A process by which a musician could learn music he had never heard before. 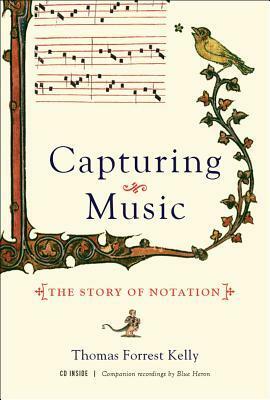 The book is not written for the professional musician, but is aimed at anyone interested in early music and learning about the conceptual breakthroughs that enabled musicians to devise a way to teach novices. It contains beautiful illustrations of manuscript pages and a sixteen track audio CD. This entry was posted in adult, nonfiction. Bookmark the permalink.